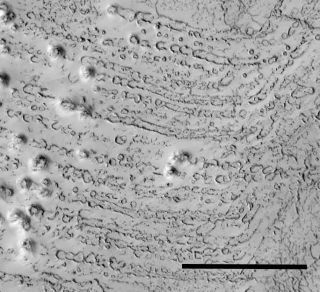 Chains of crater marks on Mars such as these could have been made by icebergs rolling across ancient Martian ocean floors, researchers suggest. AncientMars once had surprisingly frigid primeval oceans complete with their ownicebergs, new evidence suggests. There are currently two leading ideas for what the climateof ancient Mars might have been like. One is that it was cold and dry, contending that valley networksand other geological features suggestive of liquid water in Mars' past wereessentially results of bursts of heat confined in space and time, suggestingthat Mars could not have sustained oceans. The other is that Mars was once warmand wet, implying that it could once have supported lakes, seas and rainfallfor long periods. Topeer into Mars' climatic past, scientists focused on the flat, smooth,featureless Martian lowlands, which some have equated to an ancient oceanbasin. However,images captured by the HiRISE camera aboard NASA's Mars Reconnaissance Orbiterrevealed the presence of boulders about 1.5-6.5 feet (0.5-2 meters) across, aswell as chains of roughly one or two dozen craters measuring 330-1,300 feet (100-400meters) wide scattered throughout the northern plains. Both these details arehard to reconcile with the notion of fine-grained sediments deposited on a deepocean basin, and had been used to cast doubts on the concept of an oceanon Mars. Nowastrobiologist Alberto Fairen at the SETI Institute and NASA Ames ResearchCenter and his colleagues suggest the presence and distribution of theseboulders and chains of craters could have been caused by rock fragments carriedby icebergs, a common process on Earth. Theysuggest glaciers in the highlands could have eroded the terrain, transportingrock within them and on their surfaces. Armadas of icebergs would have formedat the edges of glaciers as they melted and broke apart, which could then floatthousands of miles on the ocean before they disappeared, depositing rockdownward. Also,on Earth, when icebergs scrape against the ocean floor, they can rain bouldersdown in clumps, which could explain boulder clusters up to about a mile (1.6km) wide that scientists have seen on Mars. In addition, when icebergs rollalong the sea floor on Earth, they can generate strings of dents, perhapsexplaining the chains of craters seen on the Martian lowlands. Ifthere were icebergs, then there were open and sizable bodies of stable liquid wateron the surface of Mars, Fairen said. "Thesize of the water bodies may have ranged from several local seas to a singlehemispheric ocean, and they may have been continuous in time or episodic,"he told SPACE.com. Somemight suggest that the scattered boulders were deposited by so-called periglacialprocesses, Fairen said ? that is, processes that take place at the edges ofglaciers. However, such processes cannot give a satisfactory explanation forthe boulder clusters that HiRISE also saw, he noted. Othershave also suggested that the crater chains were formed by volcanic processes. "Butour analyses can discard this hypothesis, especially because all the craterswithin one chain are almost identical in shape and dimensions, and that'sneither expected nor usual in a volcanic process, but is expected if all thecraters in the chain are carved by the same iceberg," Fairen explained. Fairenadded that scour marks some 0.6 to 3 miles (1 to 5 km) long seen in thenorthern plains and Hellas Basin of Mars could be evidence of icebergs as well.These could have been carved by the keels of icebergs scraping against theocean floor. "Thescours are the most clear evidence for icebergs that we are finding," hesaid. Fairenand his colleagues detailed their findings at the 2010 Astrobiology ScienceConference in April.